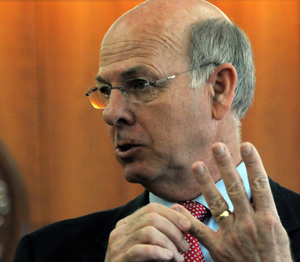 The chamber spent $436,953 helping to elect Steve Pearce, a New Mexico Republican, almost 20 percent of the total that he was able to raise and spend on his own. This month, Mr. Pearce told the radio program “News New Mexico” that cutting federal spending was just as important as increasing the debt ceiling. Set aside that the debt-ceiling “Armageddon” is pending next Tuesday and the other has been pending since Bush and Congressional Republicans spent the Clinton-era surplus on tax breaks for the rich, Pearce evidently wants us to believe that in order to hold off the second already held-off Armageddon, it’s necessary to bring on the first. Hey, Chamber, thanks for sending us this leader. Thanks a lot.